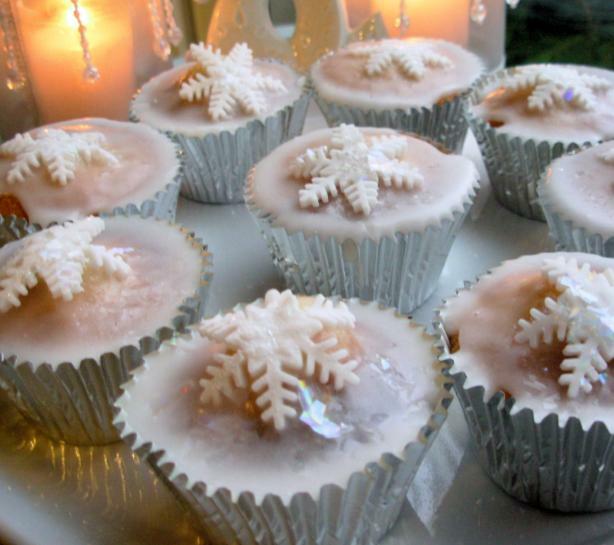 Some recipe classics never go out of fashion and fairy cakes top the list for me. They are the stuff of childhood memories: just one nibble can transport you back in time and even today no self-respecting children’s birthday party would be without them. That said, why should children have all the fun? With just a little tweaking, fairy cakes can be turned into elegant and sophisticated grown-up fare; perfect for a mid-morning coffee break, or tea in the afternoon, or as a packed lunch treat AND for the Christmas tea time table. 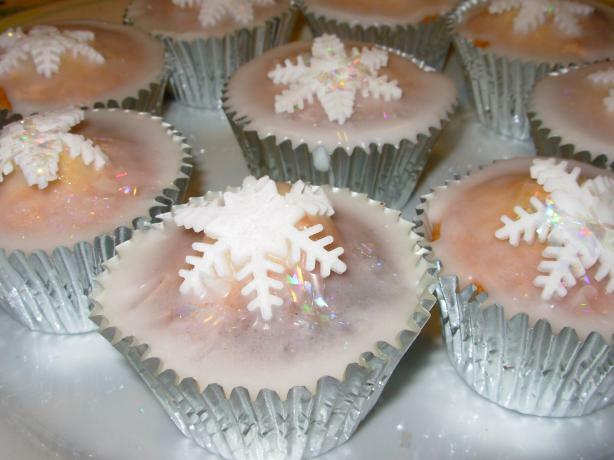 The basic recipe is oh-so-simple, so you can keep it plain or indulge yourself with extravagant toppings; for Christmas I have used my snowflake plunger again and made fondant icing snowflakes, before liberally sprinkling with edible sparkles/cake glitter. Some die-hard purists may omit the vanilla extract but I think fairy cakes are better with it added. Prep time includes the time it takes to decorate the fairy cakes. The edible cake sparkles and glitter is available from most good cake decorating & sugar craft shops, or by mail order. Makes 24 mini cakes or 12 larger ones. For mini cakes you will need a 12 hole tartlet tin (these are 5cm at the rim and 1 1/2 cm deep) and you will need to use it twice, unless you have two. For larger cakes use a 12-hole bun or muffin tin (these are 6 1/2 cm at the rim and 2cm deep). You can use the little paper cases according to the size tin you have – I have suggested silver. If not, butter the base and sides of the holes before filling with the mixture. Preheat the oven to 190C/375F/Gas mark 5. Either butter the tin or place the paper cases in the holes (see above). In a mixing bowl beat the butter and sugar until pale and fluffy. You can use an electric whisk or a wooden spoon. Add the beaten egg, a little at a time, whisking to incorporate, then beat in the vanilla. Sift in half of the flour and fold into the mixture. Add the milk and the rest of the flour and fold until well combined. Spoon into the tin and bake for 12 minutes or until risen and golden on top. Allow to cool for ten minutes before removing from the tin. Cool the cakes on a cooling tray/rack. Mix a little water to the icing sugar until you have a soft glace icing – add a little vanilla extract if you wish, or other flavourings. Spoon the icing over the top of the cooled fairy cakes, allowing the icing to drip down into the cases or over the sides of the cakes. Roll out the fondant icing on a board with icing sugar sprinkled over to stop it sticking; press or cut your festive shapes and place one on top of each iced fairy cake. 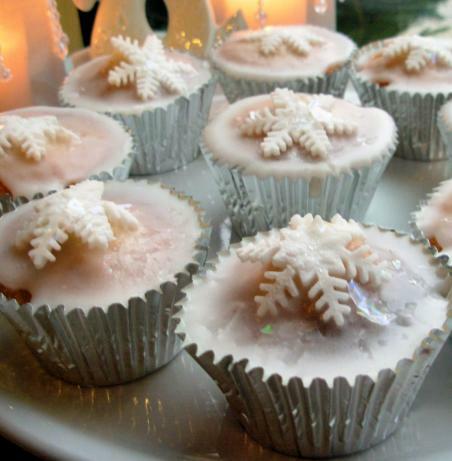 Sprinkle over the edible glitter or sparkles and arrange the fairy cakes on an attractive serving plate. A powerful winter piece by Loreena McKennitt from her last album A Midwinter Night’s Dream. cute cupcakes!! 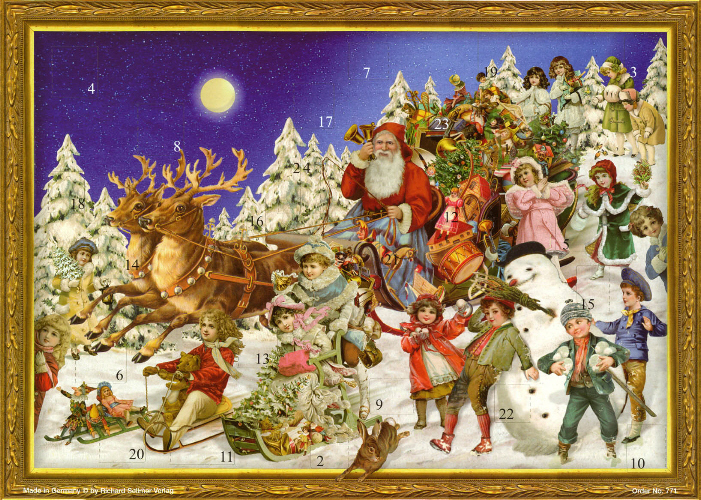 Wishing you a very Happy Christmas and a wonderful 2012! Just lovely Karen – the cakes and the carol. I like LM too. Hope you have a truly magical Christmas. 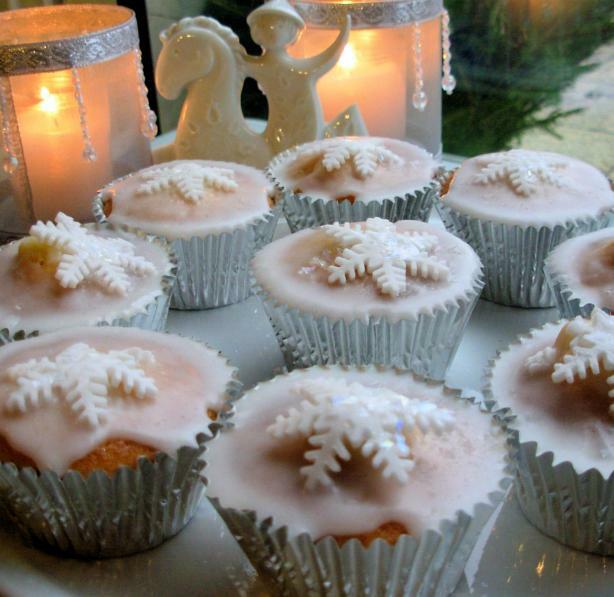 Gorgeous fairy cakes! Have a lovely Christmas! Karen these really look wonderful and where would we be come Christmas time without a snowflake cutter, the silver cases really do add to the icy feel of the cakes. Happy Christmas ! These cakes do indeed look magical. One of my favourite carols too. Thank you for this festive post. Merry Christmas. So pretty, thanks for all your advent posts, they have been beautiful. Time to settle down and enjoy the season, cheers and Merry Christmas! These look delicious as always Karen. Thanks Karen for such an amazingly festive set of Christmassy posts throughout December, all great and I shall feel quite bereft after tomorrow…. Thanks so much for your lovely comments Jenny! These look so perfect, almost too good to eat. I bet they taste as good as they look aswell. I bought one of those snowflake cutters last year but as we went away last Christmas I didn’t have a chance to use them. So I love the way you have used the snowflakes on the Christmas Cake and Fairy Cakes, hopefully I will get a chance to use the cutter this year.